By Tom Rath and Donald O. Clifton, Ph.D. 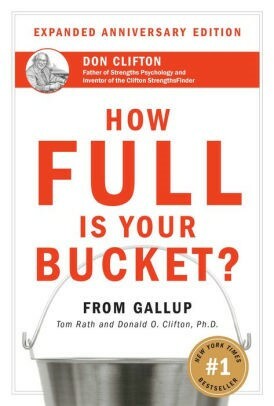 Organized around the idea that each of us has an invisible bucket and an invisible dipper, this book shows us how to greatly increase the positive moments in our lives – while reducing the negative. Like the cup that runneth over, we are at our best when our buckets are overflowing and at our worst when they are empty. Also, in each of our personal interactions, we can use our dipper either to “fill” or to “dip” from other’s buckets. Do we fill others buckets or we dip from them? We have a choice every day to do better. The St. Olaf Book Club meets monthly at the parish, in the Fleming Foyer. The books cover a variety of topics, and all are invited!